Below are Western or cowboy table runners for sale. A table runner is a long, narrow, decorative cloth typically used on a dining table (but they do have other uses, too, and we mention a few of these below). They can be use alone on a bare table, or in conjunction with a tablecloth. Table runners can be subdued or bright, plain or fancy. They can be used as a stand-along featured piece, or they can tie in with the rest of the room to finish out a theme. You might also like: Cowboy Placemats or Western Placemats. Below: A beautiful Western table runner on a wooden table. From Zazzle. Below are Western or cowboy table runners for sale on Zazzle, Amazon, and eBay. As we said above a table runner is a long, narrow, decorative cloth typically used on a dining table. They can be laid across a bare table, or across a tablecloth. They are used as decoration, either as a stand-alone piece or to finish out a theme. The traditional and still common use of a table runner is to lay it in the center of a rectangular (or square) dining table, allowing it to run lengthwise across the table from one end to the other. The ends of the runner are usually allowed to hang over the edges of the table anywhere from 6 inches to 15 inches. However, this varies widely with the size of the table and the "look" the user prefers. Below: Western or rustic table runners. 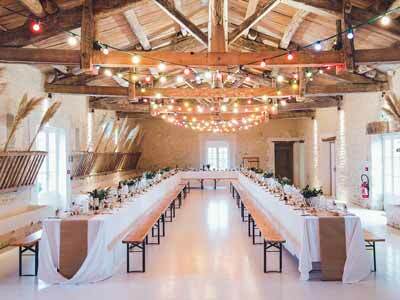 The brown table runners have a Western or rustic burlap look to them, and are being used with white tablecloths. 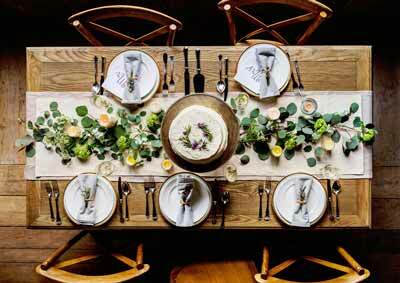 Here are a few tips on how you can use a table runner. Table runners typically drop off the ends of a dining table anywhere from 6 inches to 15 inches. The drop varies with the size of the table and the look the user prefers. It's worth noting there are no hard and fast rules about the amount of drop: Some table runners are allowed to go nearly all the way to the floor. There's no rule that says a table runner had to drop off the edges of the table. A table runner is a decorative element, and as such you can decorate with it as you like. A shorter table runner that doesn't drop off the edges of the table, or even that ends significantly before the edges, can look great, too. Speaking of using shorter table runners, you can highlight a table centerpiece by using a short table runner just underneath the centerpiece. Table runners are often associated with being used on square or rectangular tables. However, that doesn't mean you can't use them on round tables, too: Just place two table runners shaped like an "X" across a round table. Table runners look great on other pieces of furniture besides dining tables. Try them on bedroom dressers, across the top of entertainment centers, or anywhere you would like to add a little decorating flair. Below: Two table runners (one that drops over the edge of the table beneath one that doesn't) being used without a tablecloth.